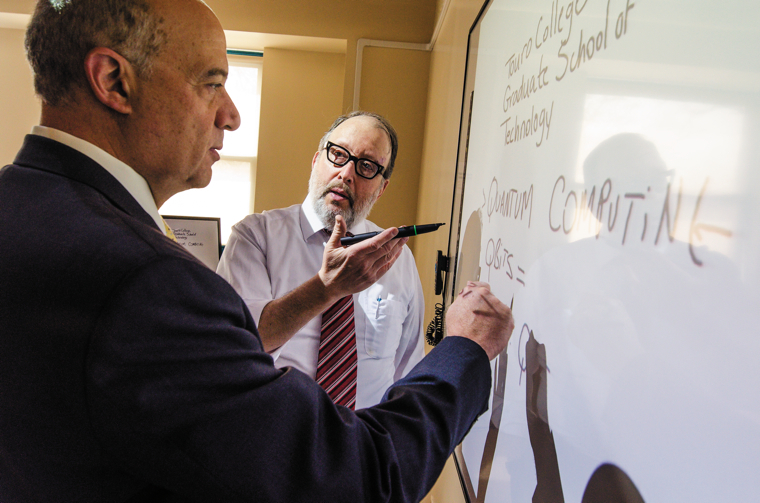 Touro College’s ISSAC HERSKOWITZ and PHILIP CHARACH say interactive whiteboards can be incorporated in many disciplines. There are more than 40 PolyVision interactive whiteboard–equipped classrooms throughout the widespread facilities of New York's Touro College, where Director of Instructional Technology Philip Charach says their use across a variety of disciplines is growing. At Touro's Graduate School of ­Technology, Dean Issac Herskowitz says faculty use the boards to share their hands-on technology ­experience and technical knowledge in information systems, instructional ­technology, and web and ­multimedia design courses. "Faculty are especially well-positioned to take advantage of the ­PolyVision eno boards because they use the latest technologies in their day jobs as technology leaders and teach graduate courses in the evenings." Use of the whiteboards is not limited to technology faculty, however. Charach sees users "across the entire spectrum of disciplines, including math and health sciences," he says. Because higher ed professionals may not be as familiar with the technology as the K–12 set, the key to a successful IWB implementation lies in proper training. Professors are given a basic class on how the boards function, and can later opt to take an advanced program that covers more sophisticated features. "Once people see the advantages, then they ask if they can have a room equipped with the PolyVision board next semester," Charach says. The eno boards are an attractive option because they can accommodate a regular dry erase marker as well as their digital stylus, he says. There also are no network cables or power cords since eno ­functions via ­Bluetooth. Instructors use the boards to annotate PowerPoint presentations or capture other notes during class time; handwriting ­recognition enables notes to be easily converted to text. "Use of the board in ­mathematics instruction is particularly popular," Charach says, "because complex formulas can be reused or refreshed without having to be rewritten, and notes created during class can be printed out immediately to be shared with students." At the College of Westchester, also in New York, CIO Kelly Walsh says ­PolyVision eno boards have been strongly embraced by the digital media program. One instructor in ­particular likes to use the boards to demonstrate design applications, Walsh says. Others have started to use the boards for lecture capture. "Technology courses can clearly benefit from the use of the boards, but I believe there is plenty of opportunity to use them in any discipline," Walsh says, adding that proper training is a must. "Instructors are busy, and many are not going to go out of their way to learn it all on their own." "The interactive whiteboard is a tool that lends itself to direct instruction, but it does not dictate that all the instruction needs to be teacher-directed." — Ann Leaness, English Teacher, Franklin Learning Center, Philadelphia; Graduate Education Adjunct Professor, Neumann University, Aston, Pa.
"IWBs have the potential to be effective for any discipline or course of study that requires its students to complete a task with group work or includes some aspect of project-based learning to assess learning outcomes." — Rachel Drummond Sardell, English Instructor, American English Institute, University of Oregon, Eugene, Ore..
"Looking into the future, we foresee entire walls becoming interactive repositories of content, where files can be not only displayed, but also checked for viruses and then made available for downloading and sharing." — Daniel S. Christian, Senior Instructional Designer in the Teaching and Learning Group, Calvin College Information Technology, Grand Rapids, Mich.